On March 22nd, we asked you to contact House Rep Brad Witt to express your concerns with his House Joint Resolution 13. As many of you who contacted him know, Rep Witt has heard your concerns and agrees that in its current form, HJR 13 is overly broad and could well create situations Witt never intended. He has agreed to rework the resolution to address those issues. But there is lots more to be done. As you know the passage of SB 941 in 2015 has caused all of the problems we predicted it would. 941 outlawed most private transfers of firearms and was nothing more than a payoff to Mike Bloomberg and an attack on law abiding gun owners. We repeatedly warned legislators that this bill was dangerous and opposed by most counties and most Sheriffs. The anti-gun liberals in the legislature and big city cops who supported this law showed no interest in actually enforcing it when one of their own anti-gun activists blatantly violated it. But the damage it has done to Oregonians is incalculable. The liberals who pushed 941 through to pay Bloomberg back for the money he poured into Oregon claimed the bill was about “safety” and “keeping guns out of the wrong hands.” They told us it was for the good of “domestic violence victims.” And of course, it was all lies. In fact, 941 has made Oregon a far less safe place. As we have reported many times, when people who are identified as “prohibited persons” attempt to buy guns, they are virtually never arrested, even if they are actively wanted at the time! Under 941 it is now a crime to safeguard a firearm for a neighbor who is going out of town or a friend who needs to remove a gun from his home for personal reasons. This from the same people who are demanding “safe storage” of firearms. But it’s even worse than that. As result of the refusal of the anti-gun left to even consider the consequences of SB 941, Oregon has put its most vulnerable directly in the cross hairs of violence. Oregon has a program for people who have active and credible threats against their lives. It’s called the “Address Confidentiality Program” and participants essentially live in hiding. Thanks to the leftist supporters of SB 941, all of whom generate plenty of theater about protecting the victims of domestic violence, anyone covered under the program is forbidden from buying a gun. You heard that right. The law forbids people who live in daily fear from purchasing a firearm to defend themselves and their children. This is so obviously wrong it is hard to believe that even the most ardent haters of gun rights could justify it. But of course, they do. Make no mistake, all of SB 941 is flat out bad law and we want to see the whole bill repealed. But as we move towards that goal we want to reverse as many of the worst elements of the bill as we can. There are other effects of 941. For example, people who live in recreational vehicles can no longer legally buy firearms if they have a “continuous traveler” driver’s license and now even antique firearms require a background check for a “private” transfer, something not required for a purchase from a dealer! Quite a few good bills have been introduced by our friends in the legislature. You can see all current 2017 gun bills here, but three bills that would address these crucial issues are languishing in the Senate Judiciary Committee chaired by Floyd Prozanski, one of the legislature’s most militant anti-gunners. SB 667, SB 854 and SB 855. Please contact Floyd Prozanski and tell him it’s time to fix the mess they made with SB 941. Please consider cc’ing your note to Senate President Peter Courtney who has the power to instruct Prozanski to hear these important bills. We cannot continue to allow the extremists in the legislature to keep putting innocent people at risk. Prozanski’s contact info can be found here. Peter Courtney’s contact info can be found here. The passage of SB 941 has created a whole series of problems for law abiding gun owners, while doing nothing to stop crime and is not even enforced if the lawbreaker is an anti-gun liberal. But what concerns me most is the danger it has created for people who have done nothing wrong. 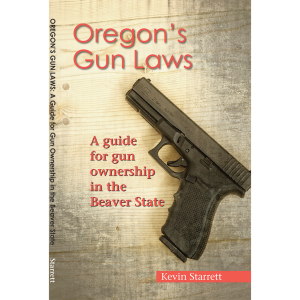 As you know, 941 outlaws the purchase of firearms by people protected by Oregon’s Address Confidentiality Program. These people are not criminals, they are victims and should not be denied the ability to protect themselves by the legislature . SB 941 also denies Second Amendment rights to people whose only crime is their decision to live in a recreational vehicle. This is pointless and dangerous. Furthermore people who want to transfer antiques to private parties are now subject to a failing background check system which is not required for purchases from gun dealers. There are bills in your committee that would address these and other issues. Please schedule hearings and work sessions for Senate Bills 667,854 and 855. It is unacceptable to put people who have done nothing wrong in danger to promote the agenda of a New York billionaire.